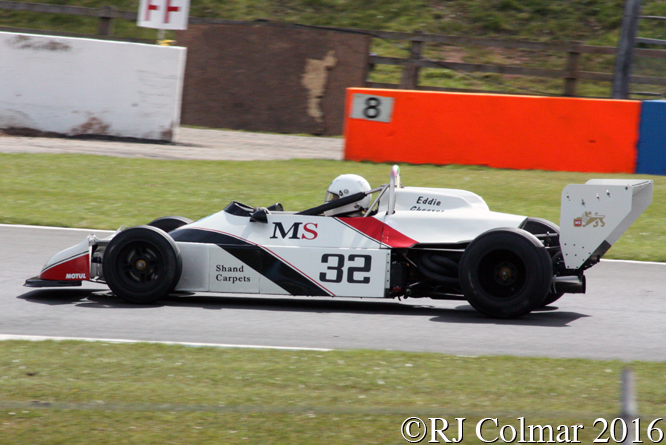 With a sunny midweek day off last Thursday I popped along to a Test Day run at Donington Park. 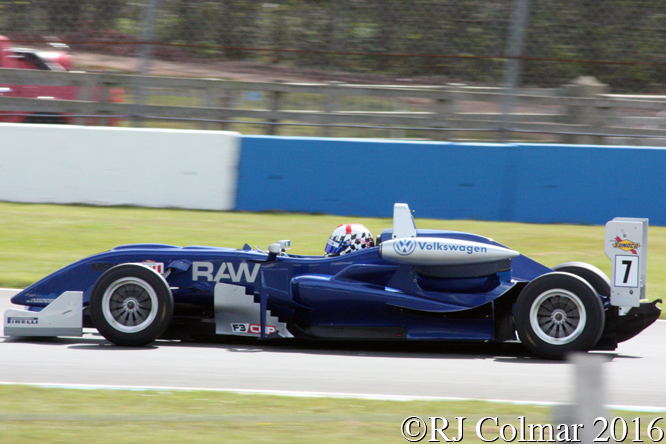 Among the large variety of machines being given a workout was the #7 Volkswagen powered 2008 Dallara F308 which is being prepared by Team Fox Racing for three time Monoposto 2000 champion Robbie Watts’s challenge for the F3 Cup. In 1977 Eddie Cheever was midway through a three year spell with the Project Four Formula 2 team run by Ron Dennis, that year he drove the BMW powered Ralt RT1 seen above to two top point’s scoring finishes at the Nurburgring and Rouen to finish second in the F2 Championship to Rene Arnoux, 39 years later I believe Rob Hall is seen testing the car above which I believe belongs to Peter Wunsch. 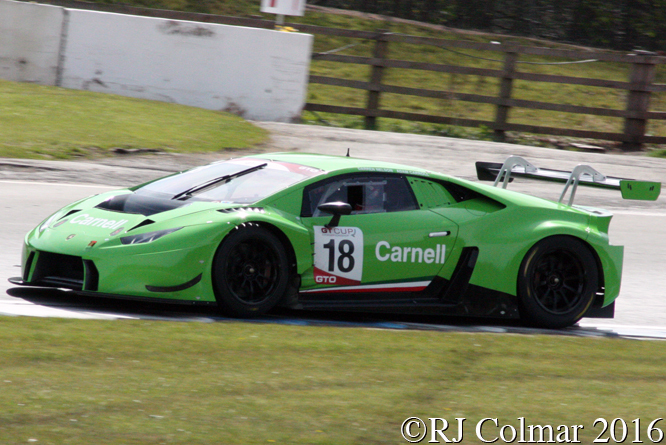 I believe Darren Nelson and Adam Carroll shared the driving of the #18 Lamborghini Huracan GT3 with which they are competing in the 2016 GT Cup, they finished second in Sunday’s opening race of the series. 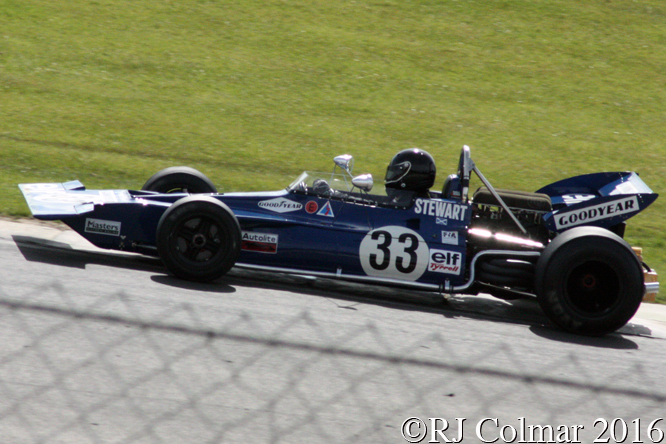 So far as I know the Tyrrell family are owners of the original Tyrrell Ford 001 seen above and loaned it to John Delane in exchange for it’s restoration and maintenance. John’s helmet is predominantly white, if you know who is seen at the wheel in this photograph’s please do not hesitate to chime in below. 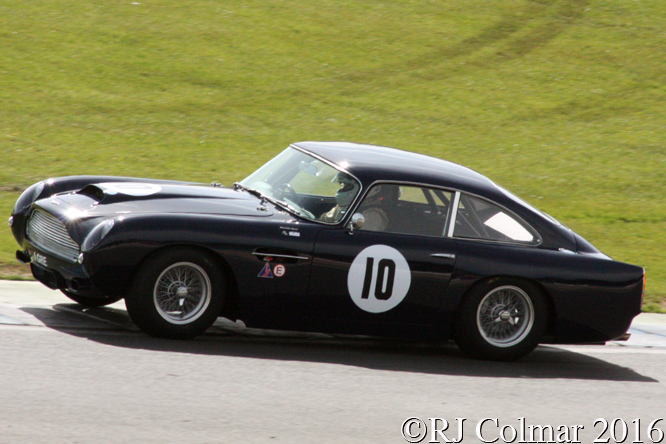 Simon Hadfield was a busy man driving both Wolfgang Friedrich’s Aston Martin DBR1 and his #10 1961 DB4 GT seen above. 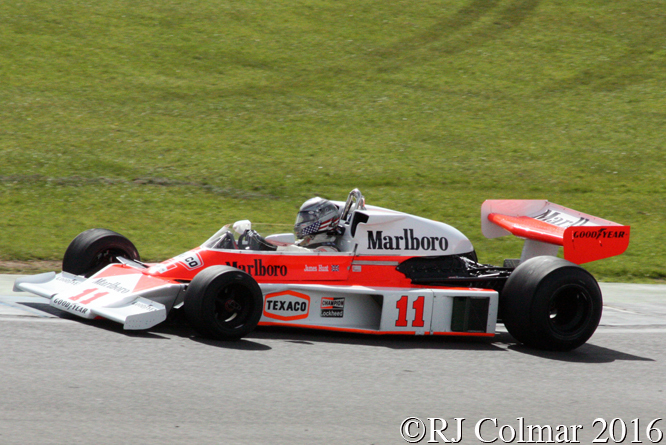 Looking for details on who might be driving the 1974 built but now 1976 spec McLaren M23/6 looked after by Hall and Hall I came across someone by the name of Scott Walker who had a similar helmet on what appears to have been his only previous appearance in the car at Jarama way back in 2011, if you know anything else about Scott please do not hesitate to chime in below. 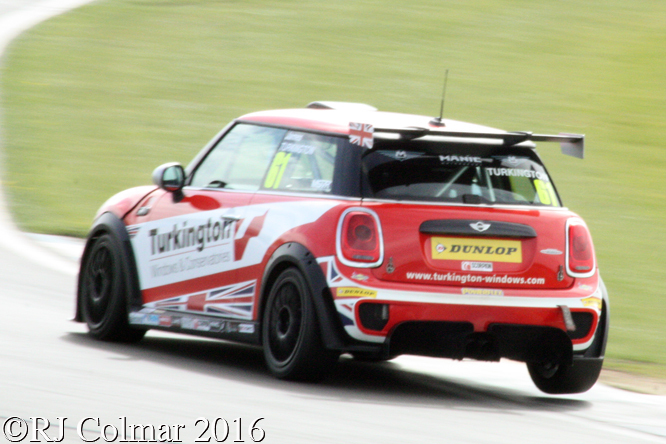 All of the above were regularly swamped by many Mini’s in Gen3 F56 spec and earlier JCW R56 spec, James, younger brother of double British Touring Car Champion Colin, Turkington will be completing his first full season of racing in the MINI Challenge with the ExcelR8 Motorsport #61 Gen3 F56 MINI seen three wheeling into Coppice Corner above. Thanks for joining me on this “Test Day” edition of “Gettin’ a li’l psycho on tyres” I hope you will join me again tomorrow when I’ll be looking at a Concours winning Packard. Don’t forget to come back now ! This entry was posted in Uncategorized and tagged Aston, Carroll, Cheever, Colmar, Dallara, Delane, Donington, Friedrich, Hadfield, Hall, Lamborghini, Martin, McLaren, Mini, Nelson, Park, Psychoontyres, Ralph, Ralt, Turkington, Tyrrell, Walker, Watts, Wunsch on April 27, 2016 by Ralph. Founded in 1899 Renault were not celebrating anything in particular at this years festival of speed but still had a potpurri presence that spanned their competition history as shown by today’s collection of photographs. In 1902 Marcel Renault drove a Type K similar to Renault built replica above to victory in the 990 km / 615 mile Paris-Vienna covering the distance in 15 hours 47 mins to average 38.95 bone shaking miles per hour. 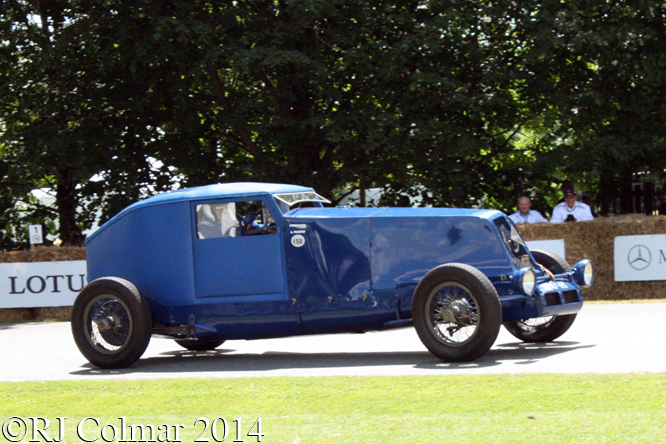 By 1925 Renault’s top model was the 40CV one of which one the 1925 Monte Carlo Rally. The following year built this aerodynamic Coupé version for a crack at the 24 hour distance record which it won by averaging 107 mph on the banked Montlhéry Circuit outside Paris. After the ’39-’45 War Dieppe garage proprietor Jean Rédélé started racing Renault 4’s with considerable and founded Alpine to capitalise on it in 1954. For 1965 Alpine built the M65 model with a 1.3 litre / 79 cui tuned Renault motor powerful enough for the M65 to be timed at 266 kph / 165 mph at Le Mans. 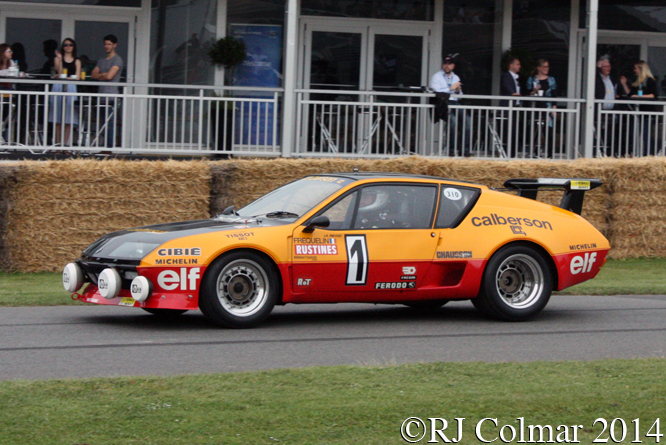 Fast forward 12 years and the now Renault owned Alpine were not only returning to Le Mans which they won out right in 1978, but they were building the mid engine Peugeot Renault Volvo V6 powered Alpine A310 sports car. A successor to the Alpine A110, Guy Fréquelin drove an A310 like the one above to win the 1977 French Rally Championship. Alpines success at Le Mans gave them a spring board from which to launch their Formula One team in 1977. Translating the theoretical advantages of turbo charging on to the track in the sports top table proved time consuming and costly but by 1979 Formula One victories started to be achieved. 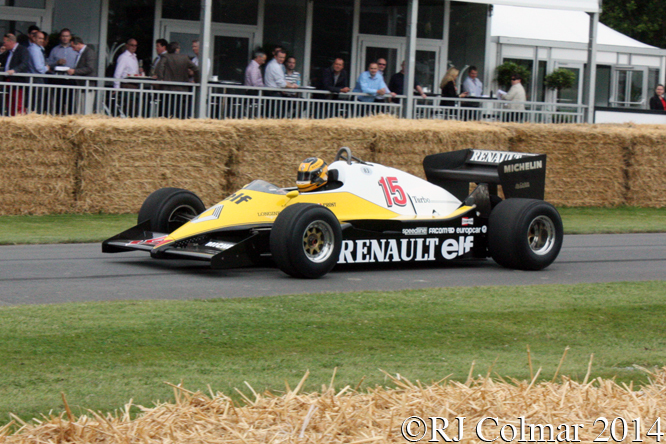 However the unreliability of their ground breaking adventure kept Renault from ever winning a world championship with their turbo charged V6. The 1982 RE 40, driven by Michele Leclere above, came closest, with Alain Prost and Eddie Cheever helping the marque finish second in the Constructors Championship to Ferrari and Alain 2nd in the drivers championship with 4 victories to Nelson Piquet driving a turbo BMW powered Brabham. 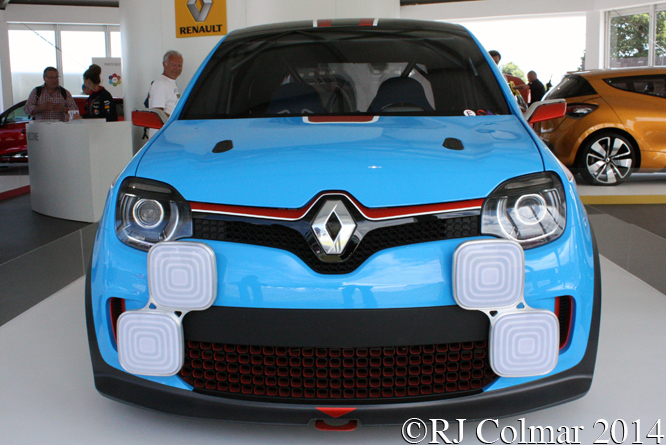 At Goodwood Renault showed us a view of their future in the form of the fully working 2013 concept car the Twin Run which like the Renault 5 Turbo Maxi and Clio V6 has a mid mounted motor boasting 320 hp. No plans have been announced for the vehicle to go into production in this configuration… yet. Thanks for joining me on this “Driving The Change” edition of “Gettin’ a li’l psycho on tyres” I hope you will join me again tomorrow. Don’t forget to come back now ! 01/07/14 Errata Tim Murray has kindly pointed out that I incorrectly identified the Renault Type K as a type AK 90CV, when this post first went out, apologies for any confusion. 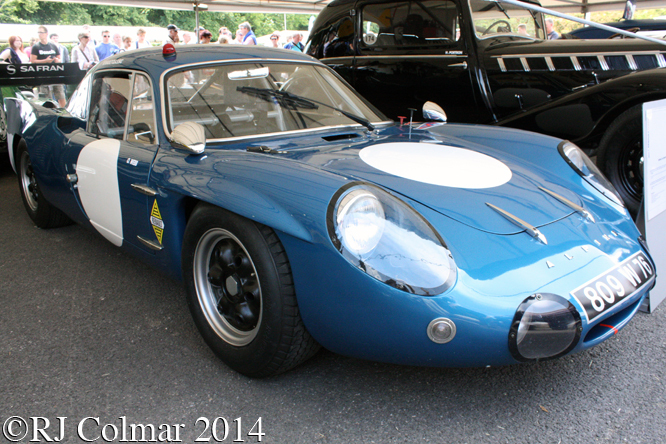 This entry was posted in Uncategorized and tagged 40CV, A310, AK 90CV, Alpine, Cheever, Colmar, Festival of Speed, Fréquelin, GALPOT, Goodwood, M65, Marteau, Montlhéry Coupé, Prost, Ralph, RE40, Rédélé, Renault, Szisz, Twin Run on July 1, 2014 by Ralph. 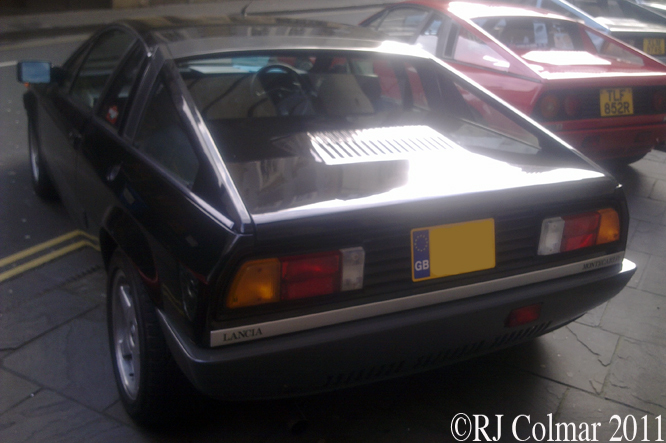 The Lancia Beta Montecarlo was based on the prototype Abarth 030 which was intended to be a big brother to the little Bertone designed X 1/9 sports car and carry a similar FIAT badge. 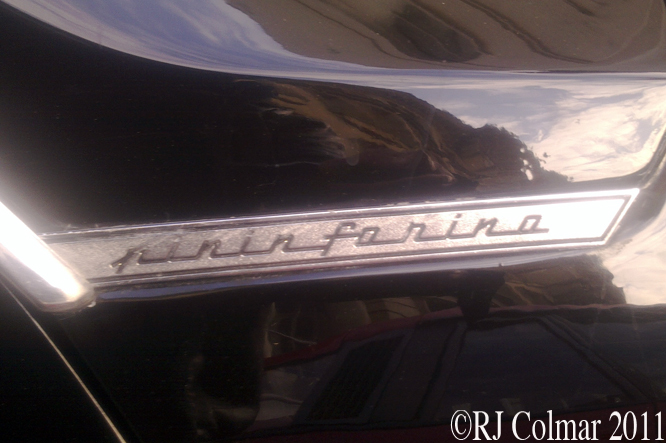 For reasons that are not at all clear the project was passed over to Lancia and the cars were constructed by Pininfarina who had designed the body work. 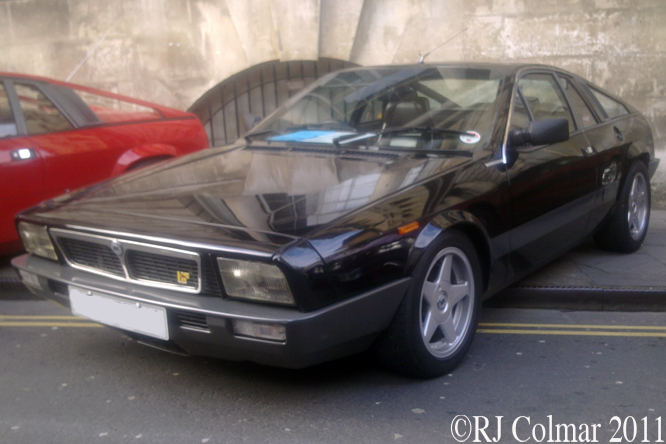 3,853 first series ‘Beta Montecarlos’ were built and 1,940 second series vehicles were built and marketed under the simplified Montecarlo, one word, name. In the US 1,801 Montecarlos known as Scorpions were sold, these are distinguishable by a pair of semi pop up round headlights. Montecarlos of both series left the factory with 2 litre / 122 cui 120 hp motors mounted transversely behind the driver, while the Scorpions had smaller 80 hp 1756 cc / 107 cui motors which met US emissions regulations. Fellow #53 Beetle fan and GALPOT Birthday boy Jeff Fuller may remember that Herbie fell in love with a powder blue Montecarlo / Scorpion called Giselle in the 1977 film Herbie Goes to Monte Carlo. 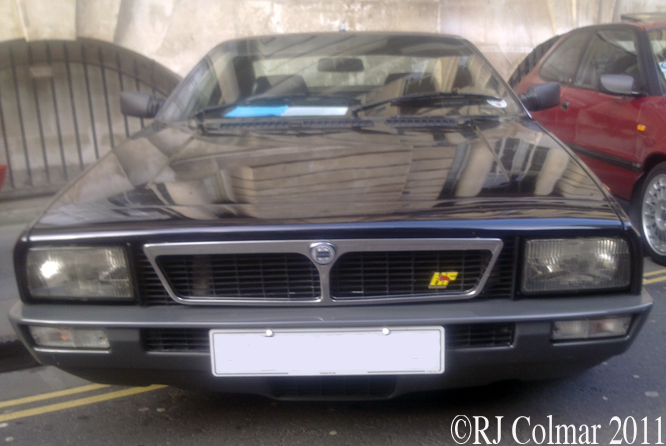 After both BMW and Porsche had withdrawn factory support for the silhouette Group 5 sports car formula in 1978 Lancia stepped up to the plate and joined the fray with a Group 5 Lancia Montecarlo Turbo for the 1979 season. Above the wild styling of the racer was matched by an equally wild paint job courtesy of the Pubbli Auto Torino graphics agency. 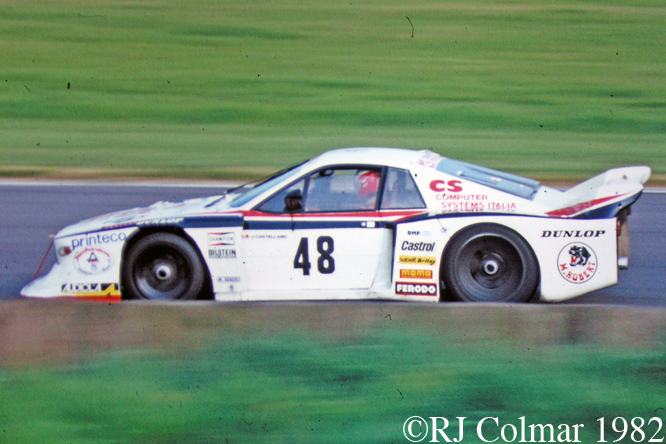 On its debut at Silverstone the car qualified 7th in the hands of Riccardo Patrese and World Rally Champion Walter Rorhl and retired with head gasket failure. 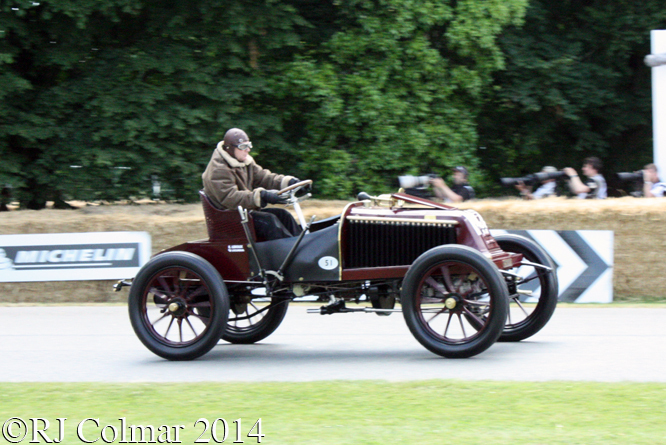 The cars eventually proved sufficiently reliable to win the under 2 litre division of the World Championship for Makes. 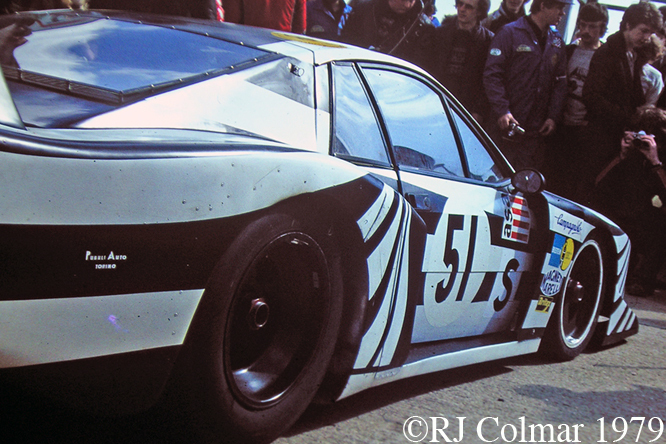 By 1980 the Dallara built Montecarlo Turbo’s had became reliable and fast enough to beat large numbers of privately entered Porsche 935’s and sundry others outright at Brands Hatch, Mugello and Watkins Glen. 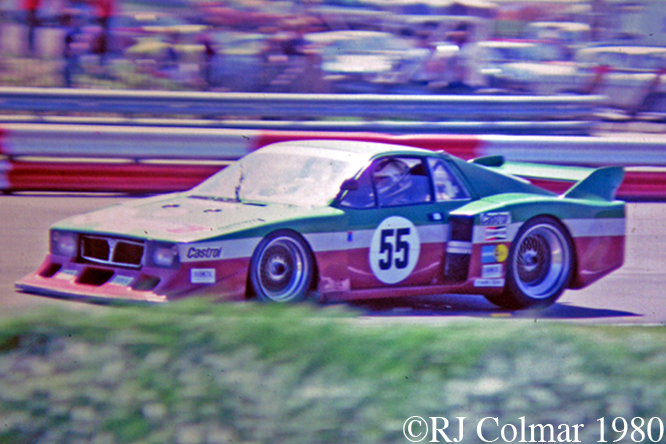 Above the #54 driven by Rorhl and Michele Alboreto scored a class victory at Silverstone which helped Lancia win the class and overall 1980 World Championship for Makes. At the end of the year two of these cars also scored a 1-2 victory on the mixed race rally Giro d’Italia having been disqualified from a similar result the year before. In 1980 two privately entered Montecarlo Turbo’s were used by Jolly Club and Team GS-Sport the former with drivers Martino Finotto and Carlo Facetti mostly entered in the World Championship races as at Silverstone above and the latter entered a car for Hans Heyer in the German DRM Championship which he won outright. 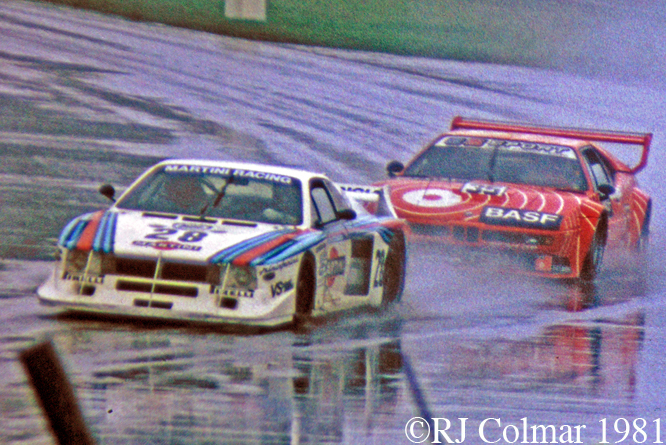 For 1981 with Martini sponsorship, as seen above with Patrese and Eddie Cheever driving at a soaking Silverstone, Lancia entered a car with a larger turbocharged motor in the over 2 liter category at selected events in order to steal points from Porsche in the over 2 liter class of the World Championship for Makes. 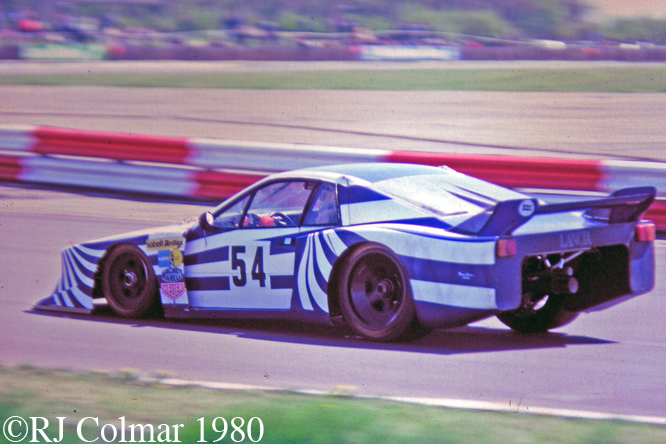 The ploy did not really work but a victory by a BMW M1 in the over 2 litre class did ensure Porsche did not have maximum points at the seasons end and so handed Lancia with a clean sweep in the smaller class the overall World Championship title. 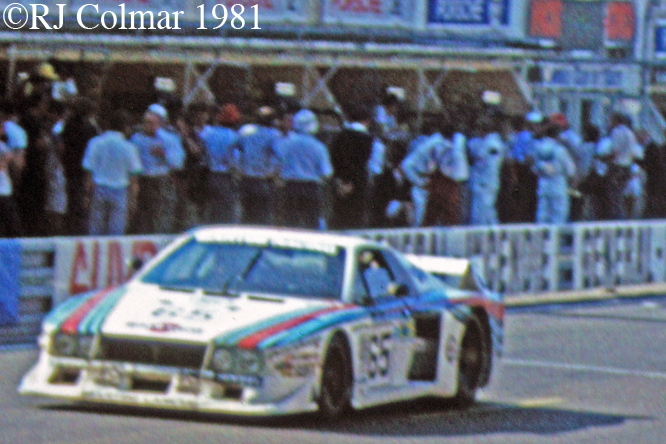 The #65 Montecarlo Turbo above was driven by Alboreto, Cheever and Facetti from 31st on grid to an 8th place overall and 2nd in class finish at Le Mans in 1981. Using the same #0009 chassis as Alboreto, Cheever and Faceti had used at Le Mans in 1981, but now entered by the private Vesuvio Racing, Prime Minister Margret Thatchers son Mark is seen here at the wheel he shared with Jim Crawford and Joe Castellano on the way to a 10th place finish in the 1982 Silverstone 6 Hour race. With no factory backing Group 5 had been dropped from World Championship status and the cars were make weights during 1982 in a series dominated by the Porsche 956 Group C cars and Lancia LC1 prototypes. I was surprised to learn that the last ‘in period’ victory for the Monte Carlo Turbo in 1983 was credited to a then reigning World Drivers Champion Keke Rosberg driving in a national race at Ahveniston Syyskilpailu in Finland. 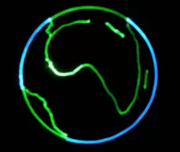 Even more surprisingly here is a link to a youtube clip of Keke’s achievement. I hope you will join me in wishing Jeff Fuller a Happy Birthday. Thanks for joining me on this Street’n’Comp edition of ‘Gettin’ a li’l psycho on tyres’ I hope you will join me again tomorrow. Don’t forget to come back now ! This entry was posted in Uncategorized and tagged 5, Abarth, Alboreto, Beta, Championship, Cheever, Colmar, Facetti, Finotto, for, GALPOT, Group, Lancia, Makes, Montecarlo, Patrese, Ralph, Rohrl, Scorpion, World on November 6, 2011 by Ralph.